There are ten variable width, variable frequency notch filters. You can operate them in audio mode, or RF mode. 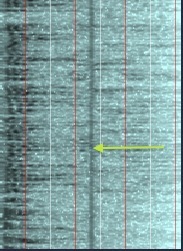 In audio mode ( RFN ), they remove audio frequencies after demodulation. This is useful if you need to remove frequencies from the demodulated audio. They are very easy to use in audio mode. In RF mode ( RFN ), they remove RF frequencies and are a bit trickier to use, but the benefits can be significant as compared to audio mode. Tip: Note that when the noise blanker NBL is set for pre-blanker view, RF notch effects will also not be visible on the spectrum and waterfall, just as the noise blanker effect is not visible. This is because the RF processing chain is split prior to the application of these two RF DSP processes in order to provide the most accurate view of the received spectrum possible. In AM or SAM demodulation mode, the interfering carrier may be on either side of the desired signal's carrier, but will result in the same audio frequency interference, so you can't just set an RF notch to the equivalent frequency in the audio spectrum. 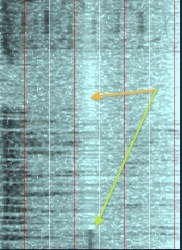 In order to account for this, in AM, NFM and SAM mode, the upper row of notches notch only above the demodulation frequency, and the lower row of notches notch only below the demodulation frequency. Because five operate below the carrier, and five above, you only have five notches you can apply to either side of the carrier -- ten in total, but limited as to which side of the carrier they will operate on. Hopefully you'll find that easy to remember. In other modes, RF notches know which side of the demodulation frequency the desired signal is actually on, and so they work more like the audio notches do, meaning you have ten available to you that function all the same. Tip: As you use the RF notches, you'll notice that when you notch above the center frequency, the RF is also affected the same distance below the center frequency -- and vice-versa. This is a result of a major speed optimization I made; it has a minor consequence in terms of receive operations: you need to use the RF notches on signals where the passband demodulation envelope does not cover the center frequency. Otherwise, this above + below mirroring will create two notches within the demodulator passband, one of them most likely where it isn't wanted. So just tune the center frequency off to the side a bit, and move the demodulator frequency off to the other side, and all will work well. NFL leaves the RF notches where you put them when you change the demodulator frequency. This allows notching out RF birdies and carriers while tuning around. For instance, if you are tracking a satellite transmission, the doppler shift will cause the signal to change frequency. If you set up the RF notches to remove the birdies, then turn on NFL, turn off SNP, then you can precisely track the dopplered transmission with a varying demodulator frequency and the RF notches will stay locked to the birdies. When a notch is selected ( Nx ), F (notch frequency) and Q (notch depth) will adjust only that notch. If the notch is on, but not selected, it will look like Nx . To turn the notch off, click Nx or Nx again and then it is off (and selected), Nx . You can turn all the notches off at once by pressing ⇑ Y or →Left-click CL ; you can temporarily turn them off using Y or →Left-click NOT. Next and Previous Notch are selected with h and g; ⇑ T turns the currently selected notch on and off; e and e adjust the notch by +/- 10 Hz; ⇑ E and ⇑ R adjust the notch by 100 Hz; and ^ E and ^ R adjust the notch by 1 Hz. Note: When you are using the audio notches, keep in mind that the purpose of an audio notch is to remove single-frequency tones within the demodulator passband audio -- not to remove adjacent RF signals (to do that, just turn on RFN and use the RF notch mode instead, or adjust the passband edges so that the interfering signal is outside the passband.) If you're working with nominally AM broadcast stations, you'll find that SAM is more flexible in this regard than AM because you can adjust the edges independently.) Whatever you feel works best for you. SAM can also help when the interfering signal is broader than a notch can remove. You can cause the notch filters to automatically turn off when you change frequency; set ANO to on to activate this feature. My favorite way to adjust the notches is by using the WTF setting of the aux scope to "see" the interfering tone, then left-clicking on the tone, which sets a notch exactly to that frequency. Right-clicking here selects the next notch, and you can go directly after the next tone, if there is one. You can also use the linear spectrum and vector spectrum to do this. Note that with the vector spectrum, the setting is still set by dragging horizontally, not around the displayed circle. As the bandwidth of the demodulator is set progressively wider, the precision of the notch frequency is correspondingly limited because there are increasingly fewer pixel positions horizontally for the mouse pointer than there are potential notch tunings. You can use the scope to set the notch close to the target, then e and R, ^ e and ^ R, ⇑ E and ⇑ R to fine-tune the setting; or you can point at F and use the mouse roller to fine-tune. I prefer the keystrokes, because I have an Apple "magic mouse" and their emulation of the roller under OS X 10.6.8 is pretty broken.